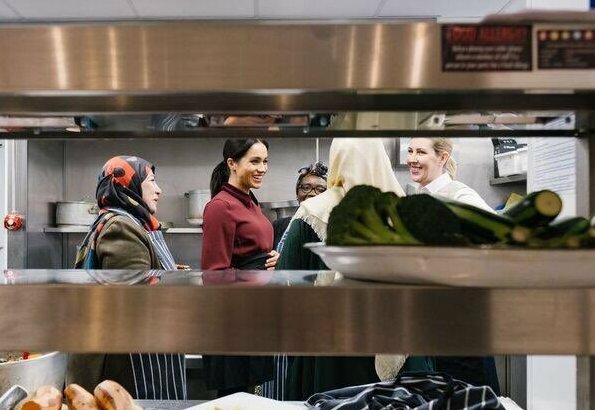 On November 21, The Duchess of Sussex visited the Hubb Community Kitchen to see how funds raised by the 'Together: Our Community' Cookbook are making a difference at Al Manaar in London. 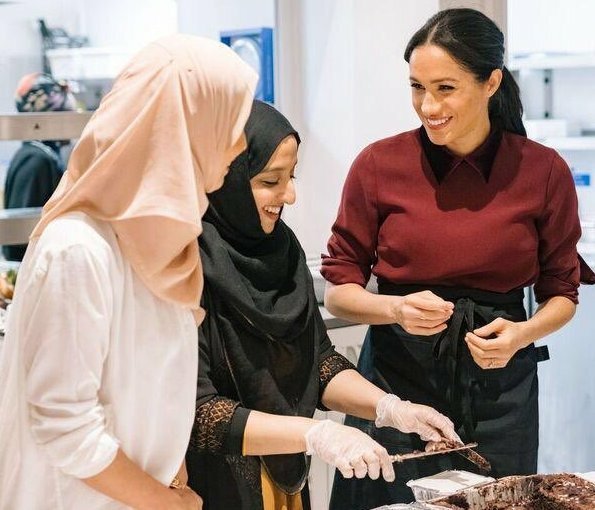 The kitchen was set up by women affected by the Grenfell tower fire and the Duchess of Sussex wrote a foreword to the cookbook to help raise funds. 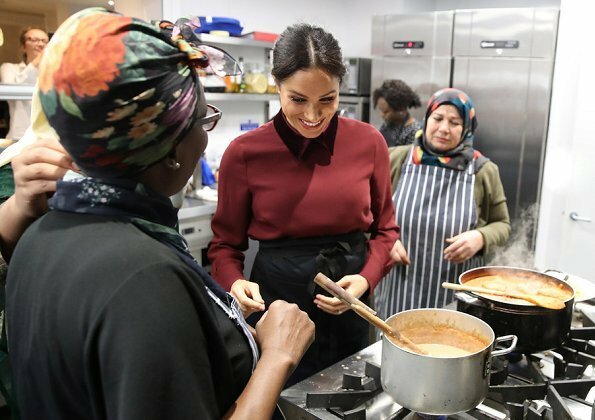 The Duchess has made regular private visits to the kitchen since January. Great stylish outfit in warm burgundy winter colors. She is one of the very few women I've seen who can carry off those shoes. Beautiful all around. Great cause, genuine support, tireless efforts and a wonderful outfit. Feeling thankful for the example she sets for all to follow. Good fall color. I do not like the boots at all. I, also have thin legs and I do not think this footwear is flattering. A knee-high boot or some black suede pumps would have been much better. That's interesting. I actually think that this footwear looks much better with slim legs. It looks very clunky and unflattering otherwise. Maybe you look better than you thought! Lovely - nice winter colours. 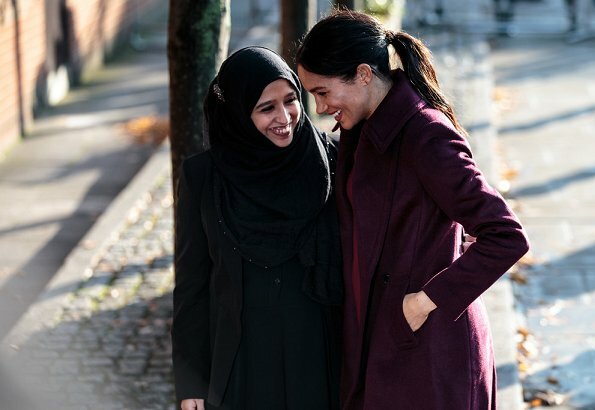 Dress and coat combination is very nice,the velvet is a nice addition .Meghan looks very good. Also love the burgundy color. Beautiful! 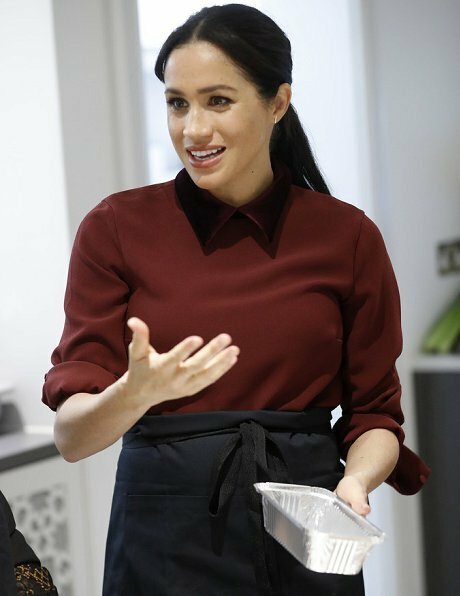 This has a Kate vibe and I love how well it suits Meghan! Very nice comeback after that horrid dress the other night. Finally much better or one of her best. makeup is nice, she does not need more. It looks as if Meghan & Kate had the same style in mind today for 2 totally separate events. Agree, and they both look very good in their Outfits. The shoes are not good on Meghan, but that is the only thing I would change. Another dress that doesn't seem to fit quite right. There is always something that looks messy about her. Sometimes it's her hair, sometimes her clothes, but it's always something. I need my humble opinion there is nothing messy ( as you put it) about her outfit, although if you would explain your concept of messiness, maybe I could understand such ugly definition when applied to this woman . Nice clean lines on the dress with a little room to spare in the waist area, the booties look fabulous on her. Great coat as well. Really? give me an example of anyone who has it all perfect then (other than yourself, I am sure)? If you need to pick at something, don't try the dress (she is pregnant after all) - come with something different (surely there are things you would have done so much better). Incomprehensible comment. Her hair is not messy, it's in a neat ponytail. The dress fits fine. She is pregnant so there is a bit more "up top" perhaps than at her wedding, but that is not messy, it's normal in her stage of expecting. Nothing messy in this outlook. She looks great. Only thing I do not like are shoes, they look very uncomfortable. She looks very stylish. Beautiful coat, dress is ok,the boots are excellent on her. Cut her a little slack , others such as Kate & Mary of Denmark were criticised relentlessly at first , & now look at how well they have grown into their positions ! Very true and perceptive comment. She rolled up her sleeves and went to work. She seems to have a deep involvement with these women.nits not just a meet, greet, photo event. She was dressed very appropriately and looked lovely. I also think she looks really good in this outfit. The colour, the style of both the coat and the dress, the touch of velvet at the top, the cute booties and the neat ponytail. All good. 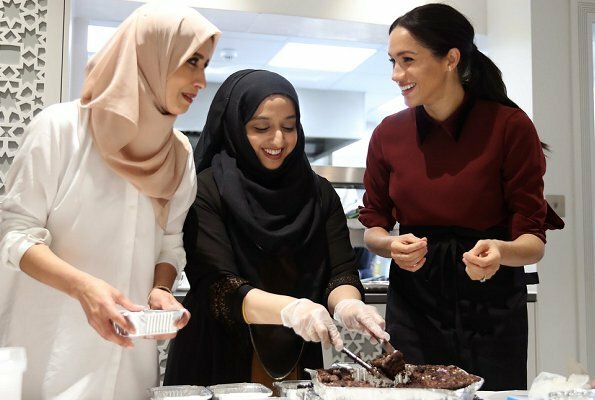 She is beaming and happy and I suspect she is really comfortable in these ladies presence, and that this project is very dear to her and very much part of her reality, as evidenced by her warm smiles and body language the last few times we've seen her involvement with them. I couldn't be happier for this lovely woman and her good work. I do not like the booties at all. But I think her hair is so much better like this without the shorter layers falling on her face. The dress and coat look nice too. I like it! But more than the clothes I love this project she jump started. I have the cookbook and have made 4 different recipes and everyone loved them! Great cause! 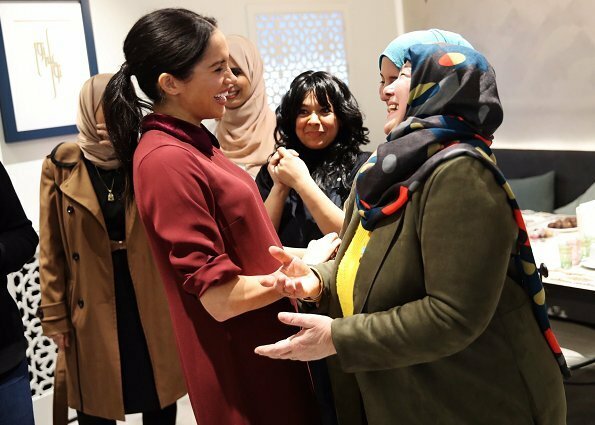 I also love the very genuine affection between Meghan and the ladies. Great to have a first hand testamonial about the recipes! I was going to buy the book but first wanted to hear from someone who had made the dishes. Thanks! Pine the cookbook is great! I love to cook and am always looking for new recipes. I have made the rainbow roasted vegetables (I do that anyway but this was a bit different), Moroccan Chickpea and Noodle Soup,Jerra Chicken, and the Vegetable Samosas ~ all very good!! Highly recommend buying. Plus it us such a great cause to support. Thanks so much for the details on which dishes worked for you, Diane! Looking forward to trying them out! Nice coat! However, I totally agree Anonymous about the shoes. I have thin legs and when I am interested in purchasing same style boots like this pairs, my sister always says I look like elf. Then, I give up. I won't touch this kind of style. Yessss. 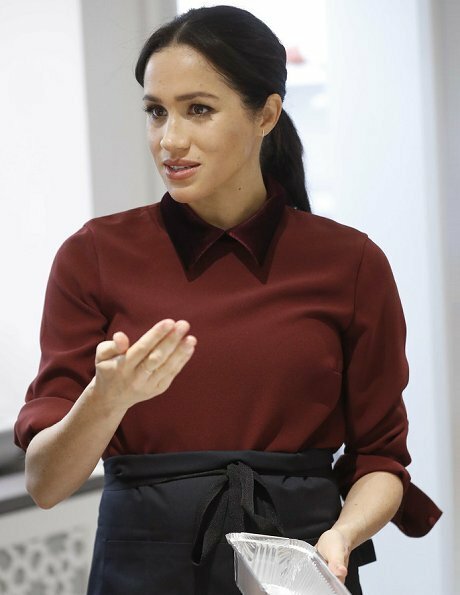 A Meghan outfit I looked at and immediately liked, even the coat hanging open. It looked fine with the short shift dress and the dark opaques flattered her thin legs. She looks lovely with her hair tied back and while I'm not sure about the boots, they are okay. One of the best outfits she has worn in my opinion. Great fall-winter look from Meghan. She looks really lovely. What a beautiful look! The color is perfect for the day, the dress suits her and the pregnancy, and the booties are fabulous! I have legs just as thin, and I would wear them in a heartbeat. 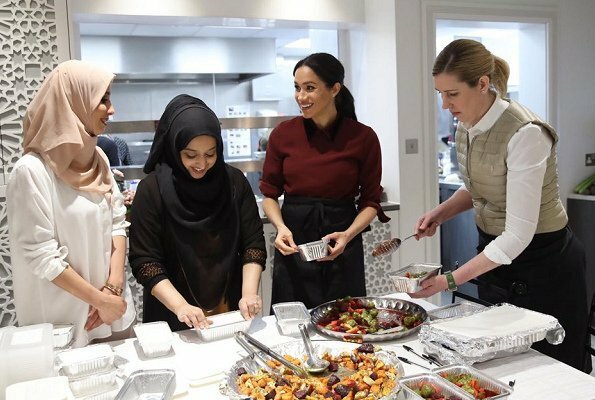 Meghan's commitment to the women and this project is heartwarming. They all look so happy together! 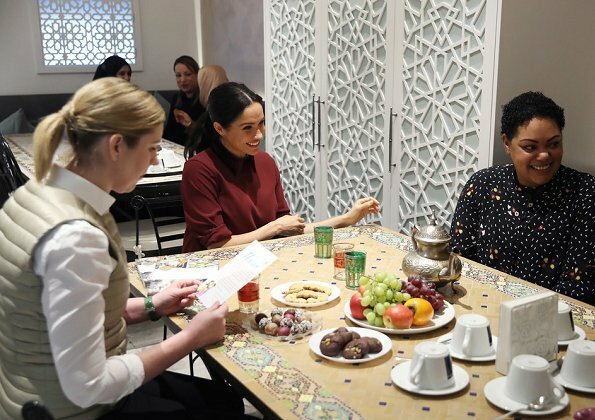 How lovely to see her more relax in an engagament. Overall she looks good.